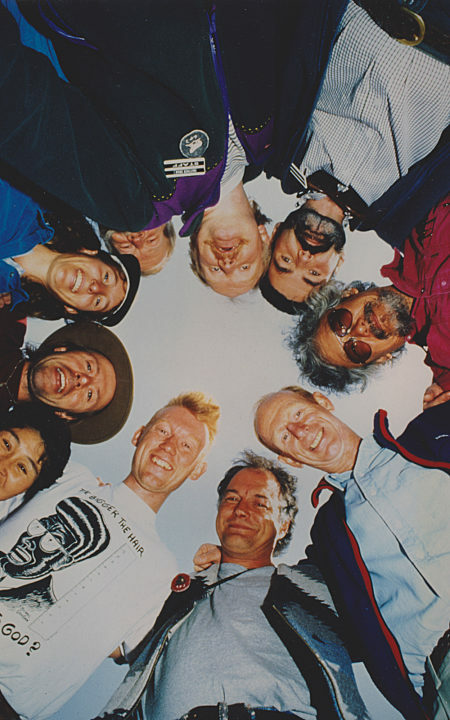 Adventure Canada began in 1987 when brothers Matthew and Bill Swan, and friend David Freeze began taking travellers to "off the map" destinations. Over thirty years later, we still do! Adventure Canada began as a dream. 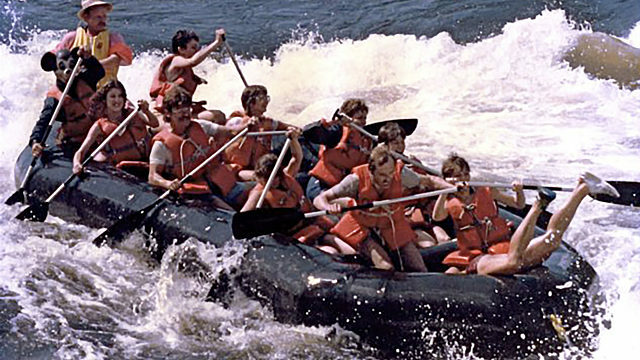 The Swan brothers, Matthew and Bill—and their good friend David Freeze—had been enjoying an adventurous life as white-water rafting guides on the Ottawa River when they came up with the idea of getting a bit farther afield. Years of wilderness guiding inspired Matt and Bill Swan and Dave Freeze to found Adventure Canada. Shown above, Matt guiding on the Ottawa River. By 1988, the young entrepreneurs were taking travellers from the south on backpacking and camping trips to what is now Nunavut. For several years, they learned on the fly—losing money, but learning how to build relationships in the North, learning how to handle logistics, and especially, how to appeal to adventure-seeking travellers. As it turned out, there were plenty of folks eager to get off the beaten trail: life-learners who wanted authentic experiences in less-travelled places. They sought out adventure on the west coast of Canada, too, leading expeditions by horseback in the Rockies. Adventure Canada’s first trip ever was hiking in Auyuittuq National Park, out of Pangnirtung. Within a few years, a request came in from the Art Gallery of Ontario, seeking to bring a group of forty art lovers to Kinngait (Cape Dorset). Could Adventure Canada handle it? Of course, Matt, Bill, and Dave said yes—despite knowing there weren’t enough hotel rooms in Cape Dorset to handle the crowd! That’s when they hit on the brilliant solution that has been Adventure Canada’s stock-in-trade ever since: ships. Aboard ships, travellers could eat and sleep in relative comfort without straining the resources of Arctic communities. Aboard ships, passengers could go from place to place in those vast areas unserved by roads. Aboard ships, the collaboration and bonding among the staff created energy and enthusiasm that made for a very special team atmosphere. And aboard ships, learning, exploring, and creating together became Adventure Canada’s signature style. A group of adventurous souls golf the north pole! Shown is Everen T. Brown making the putt. Before long, Adventure Canada was regularly running trips to three of Canada’s coastlines. In 1993, a dream was born with the launch of the Environmental Discovery Series on the west coast. 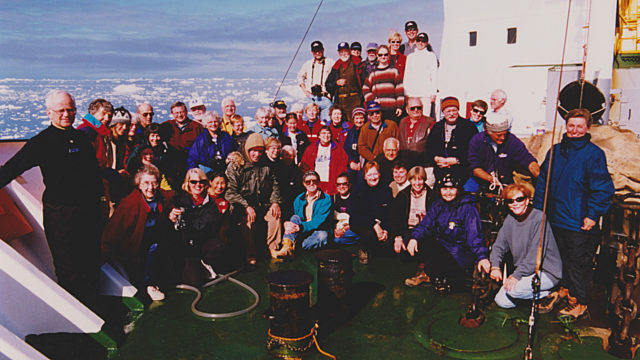 In 1994, Adventure Canada launched Project Arctic Coast, aboard the expedition cruise vessels of the day: icebreakers, research ships, former navy spy-ships. 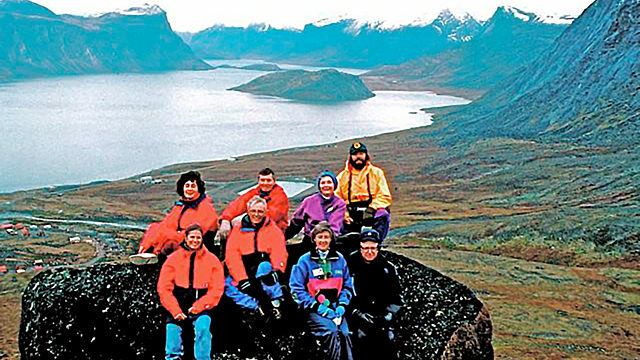 In 1995, we launched our first trip to the Labrador Coast, pioneering expedition cruising in the fjords of the Torngat Mountains of Nunatsiavut. The company built upon the collective energy of an incredible resource team and like minded guests aboard small expedition ships. 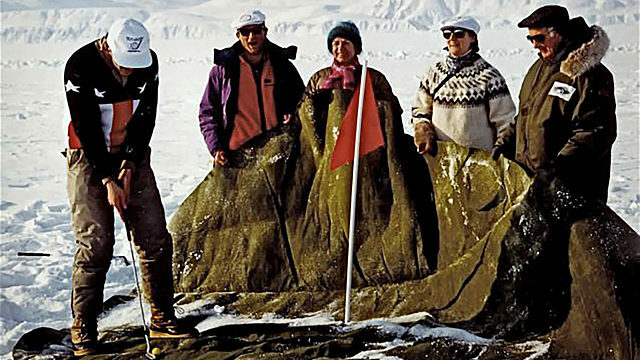 A group of intrepid guests and staff celebrating the creation of Nunavut in 1999. In some cases, the vessels we charted came with working scientists aboard, but Adventure Canada soon began hiring scientists—as well as local artists, musicians, and cultural ambassadors—to enlighten clients while steaming from one amazing place to another. Soon, Adventure Canada was working with Canada’s brightest minds and biggest hearts. 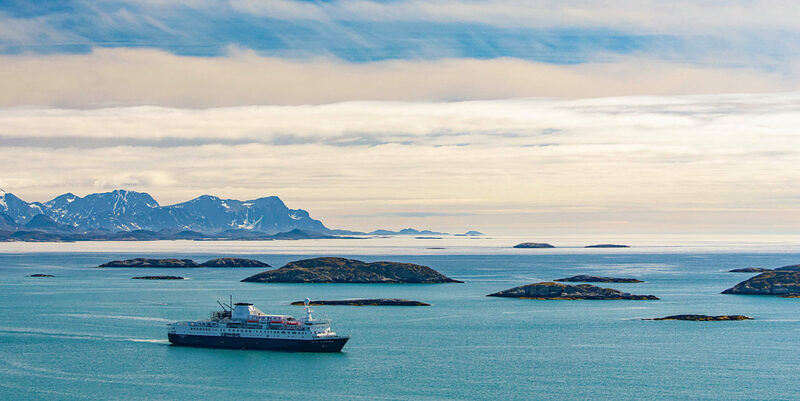 We brought Robert Bateman aboard to travel the west coast, introduced David Suzuki to cruising the Arctic, and captivated Farley Mowat with the beauty of Labrador. Margaret Atwood has now travelled with us more than a dozen times! 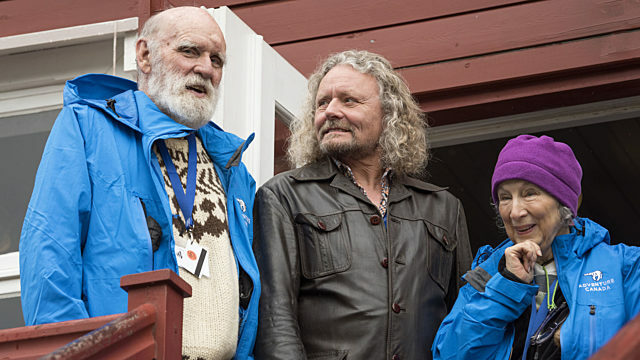 Authors Graeme Gibson and Margaret Atwood join Adventure Canada in Iceland. Today, we travel primarily on the Ocean Endeavour, as well as the Island Solitude, La Pinta, and others. These vessels are more comfortable than the older ships but still dependable, versatile, and purpose-built for Adventure Canada’s unique style of travel. As ever, it’s the nimble Zodiacs (rigid inflatable boats) that really make expedition cruising the adventure that it is. With a fleet of Zodiacs, we’re never more than a few minutes away from an outstanding landing in the world’s most remote destinations. And the diverse staff of educators, researchers, cultural ambassadors, and creativity never ceases to delight, engage, inform, and amaze our passengers. 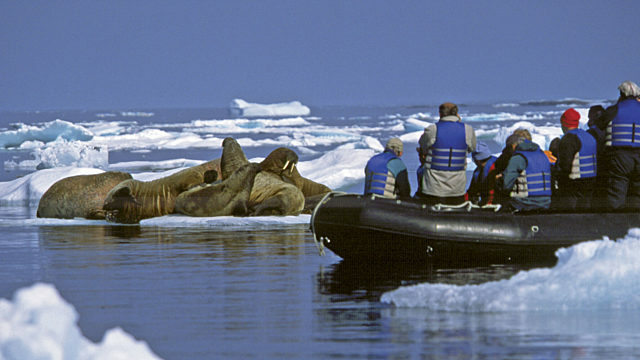 Experiencing wildlife in a safe, sustainable way is a key component of Adventure Canada’s expeditions. Along the way, Adventure Canada grew as a company. Having started as a basement operation run by three outdoorsmen, the company soon added a small staff who worked year-round, and gradually increased the number of resource staff who travelled trip-by-trip. 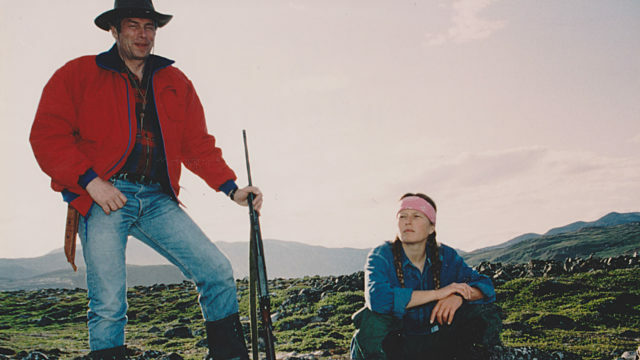 Expedition Leader emeritus Stefan Kindberg, leading one of Adventure Canada’s early expeditions. Our team of resource staff now numbers more than a hundred dynamic, highly accomplished individuals from many fields. Their expertise, local knowledge, and personal relationships activate the amazing connections that make Adventure Canada’s experiences unique. And our office staff show the same passion, commitment, and care—day-in, day-out, year-round—that we have developed aboard the ships. Leadership means always growing and evolving. 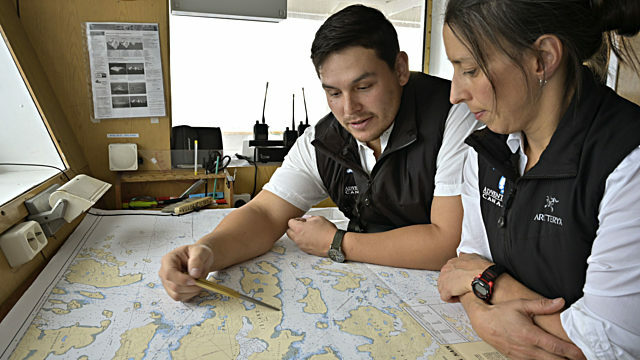 We became industry leaders by continually mentoring youth, training new leaders, and ensuring our staff are certified in all areas of expedition cruising—from bear monitoring to Zodiac operations to first aid. Adventure Canada operations are always safety first, and we continue to invest in the people and the procedures that make us industry leaders. 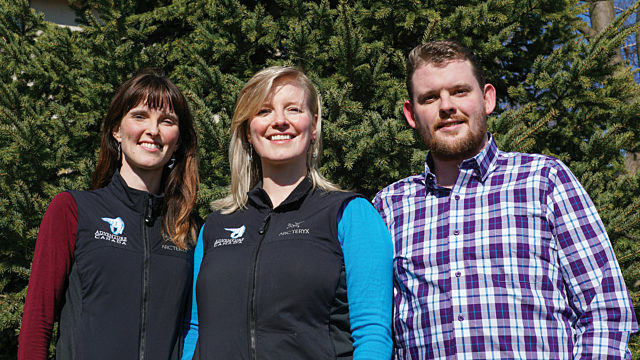 Alana Faber (Vice President of Operations), Cedar Swan (CEO), and Matthew James Swan (Director of Business Development and Expedition Leader) carry over the legacy of their father and Adventure Canada’s founder Matthew Swan. As much as the company has grown, the Swan family continues to grow, too. Cedar, Alana, and Matthew James were practically raised aboard ships, which were now heading to places like Scotland, Ireland, Scandinavia, the Caribbean, Haida Gwaii, Newfoundland & Labrador, as well as Nunavut and Greenland. Inevitably, they grew up, and are now running the show. 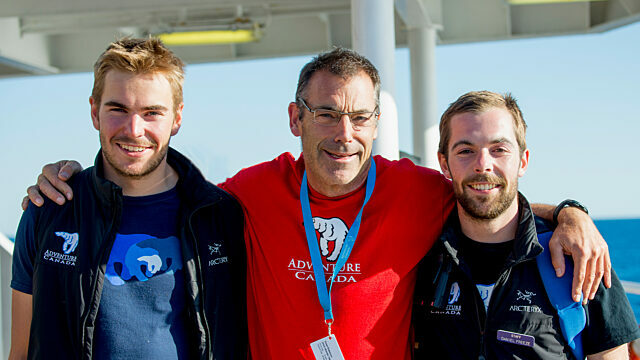 Cedar Swan oversees the team as Adventure Canada’s CEO. Alana is Vice President of Operations, while Matthew James heads up Business Development. Cedar’s husband Jason, an Inuk hailing from Nunatsiavut, Labrador works on operations and logistics. Alana’s husband Brian manages the Client Services team. Matthew James's partner Devon does double duty as a sales lead and seasoned Cruise Director. Expedition Leader Jason Edmunds plotting the expedition course with Assistant Expedition Leader Julie Bernier. Meanwhile, founders Matthew, Bill and Dave remain involved in varying degrees throughout the year. The second generation of the Freeze family Dawson, Daniel, and Gwen all work aboard the Ocean Endeavour, along with Ella Swan, Bill’s daughter. And a whole new generation of kids is on the way: Leah, Charlotte, Olivia, Brian, and Islay have all travelled aboard along with their parents, and grandparents! Adventure Canada remains a family operation at heart. And we remain committed to the same Mission that first inspired our founders: We engage, entertain, and educate by connecting people to each other and the land through innovative travel experiences. We cultivate connection and community. We celebrate culture. We are driven by heart, humanity, and hope.